Lockhart’s BBQ Lake Orion review, pics, menu info, and hours. Lockhart’s BBQ is located in downtown Lake Orion on East Flint Street. As a fan of Lockhart’s BBQ Royal Oak, and BBQ food in general, I anxiously awaited the arrival of Lockhart’s BBQ Lake Orion. Lockart’s opened their downtown Lake Orion restaurant Thanksgiving week of 2015. 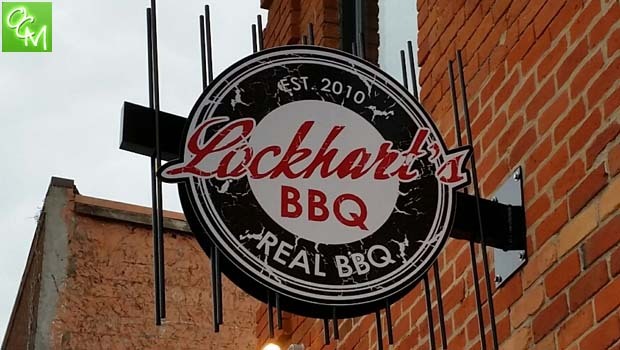 Both Lockhart’s BBQ locations distinguish themselves from other Oakland County BBQ restaurants in that both have extensive menus compared to other BBQ restaurants around town. Simply put, even if brisket and ribs aren’t your idea of a goto meal, you can find plenty of menu items to suit all ranges and tastes. Several salads, numerous sides, unique apps, smoked salmon, gumbo, jambalaya, fried catfish… All creative menu items that incorporate Lockhart’s meats and take the meals a step further to appeal to a diner whose tastes may be broader than brisket on a tray. You might even want to check Lockhart’s BBQ website before you go, the Royal Oak and Lake Orion menus differ a little. In addition to menu variety, Lockhart’s atmosphere is slightly different than most BBQ joints in Metro Detroit. You won’t find paper mache pigs on the wall or red and white checkered tablecloths. The decor is more akin to Union Woodshop than it is to Famous Dave’s. Don’t worry, it’s not The Whitney, just an attractive, clean place to dine. You could take the kids for a big meal, but you could also take a date there or enjoy a night out without feeling like you’re slumming. Lockhart’s BBQ Lake Orion is slightly different from Lockhart’s BBQ Royal Oak in terms of decor. The Royal Oak location is a bit more attractive, and more open while there isn’t quite as much room in Lake Orion. I couldn’t help but wish Lockart’s Lake Orion had a more extensive bar like Union Woodshop. Lockhart’s is a nice experience, but not quite a Union Woodshop experience – at least where drinks and fun are concerned. I didn’t take any interior pics due to the restaurant being crowded. I didn’t want bother anyone eating their lunch. As discussed, the Lockhart’s Lake Orion menu is both creative and huge. I ordered a two-meat combo (brisket & red hot sausage) that included 2 sides… I opted for potato salad and baked beans for the sides (I know, I’m a simpleton). The meats were prepared well. The red hot sausage was VERY good, hot and spicy! The potato salad was extremely tasty with huge chunks of potatoes instead of a usual mash. The potato salad wasn’t quite as good Zeke’s BBQ in Ferndale, but it was right up there! Lockhart’s Lake Orion boasts 4 sauces – Signature, Sweet, Fire on the Red, and Carolina Gold. Other Oakland County BBQ restaurants have more sauces than Lockhart’s, but 4 is plenty. I found all 4 delicious and unique. To give you an example of how unique, Sweet is actually made with root beer and grapes blended. Carolina Gold (mustard) was exceptional and easily ranks up there in terms of “best I’ve ever had”. For complete menu info for Lockhart’s BBQ Lake Orion, visit their website.